In fact, we love dogs so much here at Australia Outdoor Living that we decided to dedicate a series of blogs to our favourite furry friends! West Highland Terriers, or ‘Westies’, are a breed of dog from Scotland. Recognised by their distinctive white coats, Westies are both intelligent and great with kids. They were initially bred to hunt rodents, and as a result they possess a strong instinct to chase smaller animals. They are active and social dogs, and are popular among families with young children due to their friendly nature. Lochie is certainly no exception to this, although it did take him a little while to warm up to people in the office! His first instinct was to explore, and he made it his business to know the layout of the office as soon as he arrived. Completely ignoring everyone, he sniffed every corner, every desk, every bag and every bin before finally making his way over to the group and saying hello. When Lochie decided it was finally time to make some new friends, staff at AOL were happy to oblige. He played the room like a fiddle, receiving pats and adoration from as many people as possible. 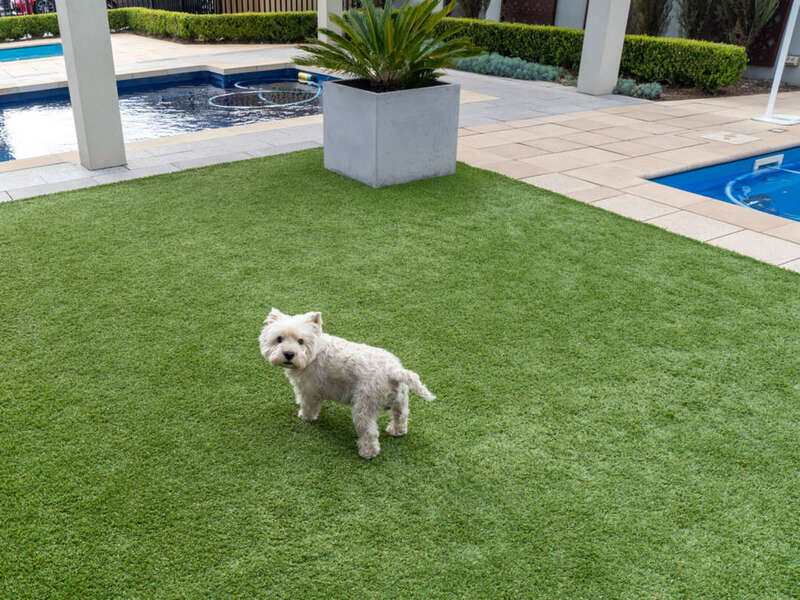 After Lochie’s lovable meet and greet, we took him out to our display centre to sample some of our products. He frolicked on our timber decking, relaxed in the shade of our outdoor blinds and carefully inspected the swimming pools. 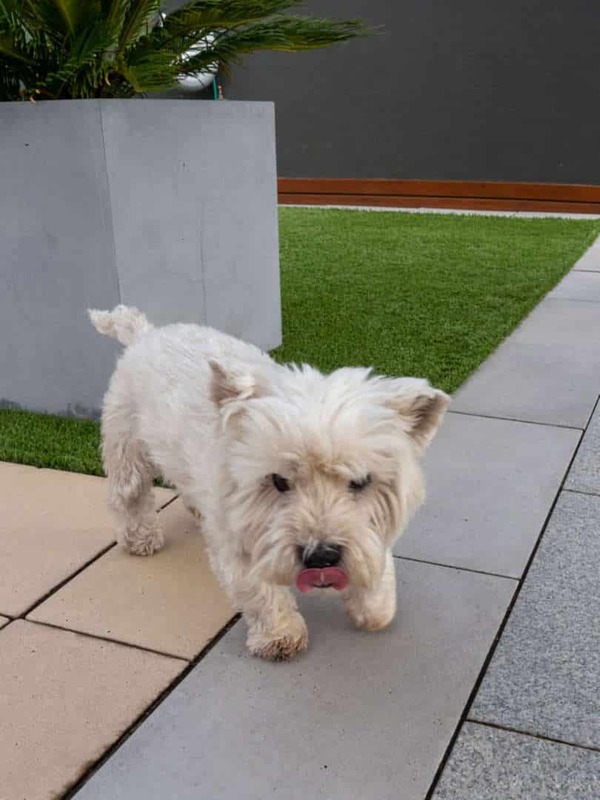 He especially seemed to enjoy the artificial grass, spending most of his time running around with a big grin on his face. Unfortunately all good things must come to an end, and Lochie decided he’d had enough excitement for one day. We loaded Lochie into the car to take him home, and he immediately fell asleep. “It was such a good surprise to come in to work and see Lochie in our office! 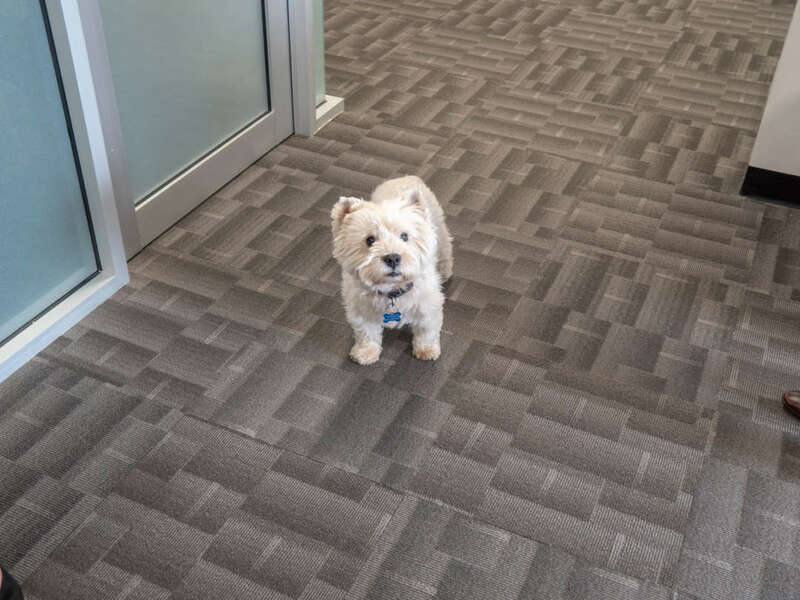 He was the happiest little guy and was very content to wander around exploring our office for the morning. We loved his nature, his haircut, and his cute little face! 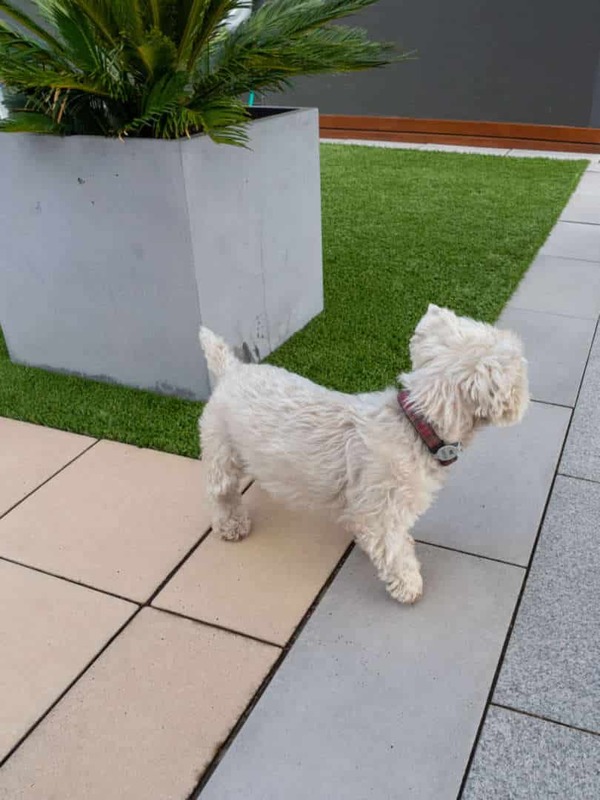 “Everyone was very excited to have Lochie pay us a visit here at the office, even though he made it very apparent that the feeling wasn’t mutual! His nonchalant attitude made us laugh as we desperately tried to call him over for a pat as he busily explored all over the office without stopping to say hello to anyone. The only time he suddenly became very interested in us was when he could smell someone’s breakfast as they walked in. “I always look forward to dogs visiting our office! “I’m probably a little biased, but Lochie is honestly the most amazing dog in the world. He can be very affectionate and often falls asleep on us, and he can be very demanding when dinner time rolls around. He’s very sassy at home when he doesn’t get his way, especially when he gets annoyed and starts stomping his little feet!